A Pictorial Map of Loveland is the work of Massachusetts graphic artist Ernest Dudley Chase (1878-1966), who was well known for his decorative, pictorial maps. Most of his maps showed actual states or regions, illustrated with drawings of the area's landmarks, buildings, famous people, or animals, and often included traditional cartographer's elements like compass roses, elaborate cartouches, and ornate hand lettering. But this map is altogether different. 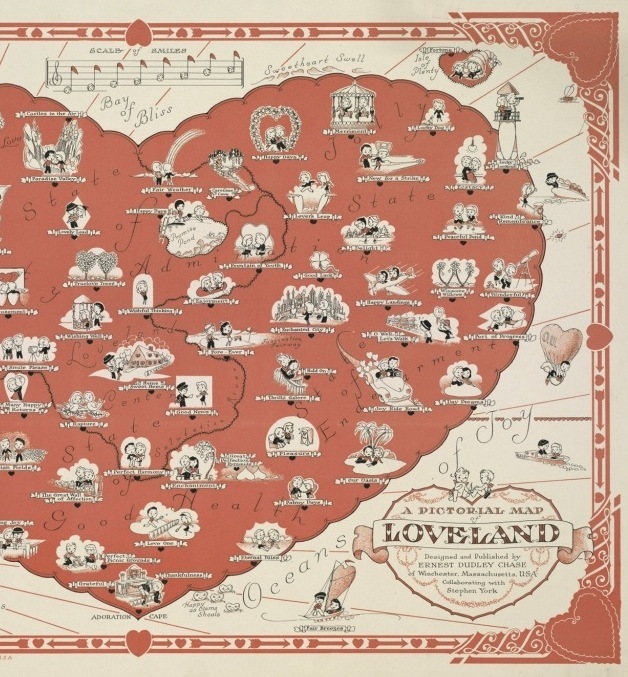 Instead it shows the mythical, heart-shaped island of Loveland ("A place where everyone should go; Where Romance Thrives, and Friendships Dearer Grow") surrounded by Oceans of Joy, Sweetheart Sound, and the Bay of Bliss. In this country with state names like State of Admiration, dozens of jolly little couples engage in all kinds of courtship amidst a world of hearts and puns. I particularly liked how often the couples seem to be equals - whether playing sports or gazing happily at their future Home Sweet Home, not far from Line of Equality. There's none of that snarky women-as-cunning-huntresses or men-as-caveman-conquerors that so often turns up in comic interpretations of love. The only hint of a more passionate kind of love is the little couple in the back seat of their heart-shaped care, the label (S)Parking Permitted. Even that seems pretty wholesome, though, and the overall feeling is sweetly, cheerfully optimistic. But if you look a little more closely, you can see hints that the war overseas is felt even here in Loveland. One little woman is waving farewell to her ship-born sweetie with the caption Kind Remembrance. Another is shown wistfully engaged in Wishful Thinking, while yet another is eagerly receiving Good News in a letter from the postman. But best of all is the couple joyfully kissing with Many Happy Returns – the ultimate goal of countless American couples in 1943. Above: Detail of A Pictorial Map of Loveland by Ernest Dudley Chase, 1943. Norman B. Leventhal Map Center, Boston Public Library. Oh, how cute! That is a sweet little map. I'd never heard of Mr Chase before, though I've seen several of his more famous maps. Love the little label next to Lustrous Lake that's just "Faster". Perhaps I've got a dirty mind, but that looks like a hint of a more passionate kind of love too! It's a beautiful and worthy diversion from the usual posts and so timely to 1943. It was a difficult and trying time for love. I cannot help, but feel a little twinge of sadness looking at this light-hearted piece as so many loves were lost. How fascinating. There's a pastiche-1940s song called 'Loveland' in Stephen Sondheim's musical Follies. I wonder if he'd seen this map. A very nice map. I must thank you for sharing it. HVAC Loveland.